Fuel cells are just emerging as an energy source that could save literally billions of tons of emissions, including and significantly reducing our dependence on imported oil supply for power. A supply of power so clean and so safe it could be located right in the middle of populated cities or even in your own home. With no moving parts a device that could power everything from a hydrogen electric car or motorbike, to an electric utility station. It may sound like something for the future but it is already here in vehicle such as the Toyota Mirai and it's called the fuel cell. Sir William Grove a well-established English scientist built the first fuel cell in 1839. But it wasn’t until 1915 where another British scientist Francis Bacon demonstrated practical use in a fuel cell stack. Only then did the practical uses start to take off with the US manned space program building on Bacon’s success. Every fuel cell has electrodes, electrolytes and produces electricity like a battery; unlike a battery it doesn't store energy. It produces power as long as Hydrogen and Oxygen are in supply, refuelling not recharging is needed, what happens is Hydrogen fuel is fed to the end anode and contact electrons are freed beginning the flow the electricity. The Hydrogen ions then travel across the electrolyte where they recombined with free electrons. The advantage of this reaction to produce electricity is only water is released as by-products. In certain types of fuel cells other ions travel from cathode to anode, instead of anode to cathode but nevertheless the premise remains the same. Electricity is generated through an electric chemical reaction by combining Hydrogen and Oxygen to form water, you also create electricity with no combustion whatsoever and this is what makes it so clean. In addition to high efficiencies and low emissions, the most attractive features of fuel cells is the modularity cell stacks consisting of individual cells which are repeated until the desired power output is reached. To change the output you just increase or decrease the number of cells. In a typical fuel cell the rip bipolar plate acts as a separated gas manifold and provides the electrical connection between the cells and creates a Gas barrier keeping the fuel in the respective compartment. There are five major types of fuel cells. Each using different electrolyte and operating at different temperatures each is well suited for specific markets today, we will talk about the following fuel cells. Alkaline, phosphoric acid, proton exchange membrane, solid oxide and the molten carbonate fuel cell. The most successful applications for Alkaline fuel cells have been in the US space program providing electricity and drinking water to all manned space missions since Apollo in the late 60s. The alkaline fuel cell uses only pure hydrogen fuel, pure oxygen is too sensitive to carbon dioxide contamination. The highly sensitive potassium monoxide electrodes consist of crystallite structures with gold plated metal conductor's. Current research is focusing on terrestrial applications and advantages including lower cost application and operation in lower gravity environment. 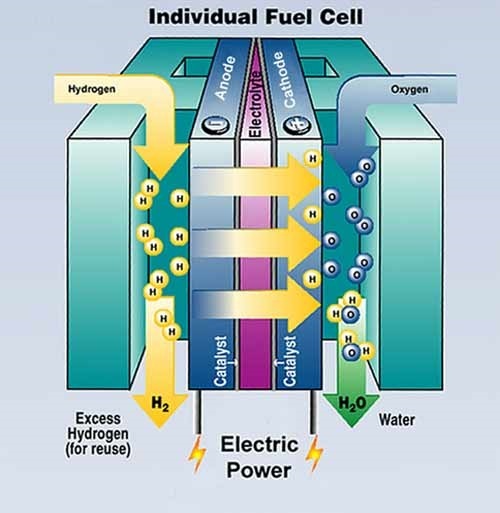 The fuel cells do not require pure hydrogen but can use hydrogen rich fuels such as methanol or natural gas but first the fuel must be processed. One method is called the steam reforming process, how it works is that hydrogen from the fuel cell is mixed with air and burns to form the catalyst. Fuel and water vapour rises in the fuel cells, creating heat and by-products. The mixture flow through the centre this In turn accelerates the chemical reaction, producing carbon dioxide and hydrogen. The phosphoric acid fuel cell is the most commercially developed, it can operate on a variety of reformed carbon hybrid fuels and uses air for the oxygen. It is already being used to generate power for hospitals, hotels and office buildings among others, and it's applications goes beyond power stations. Recently a phosphoric acid fuel cell has been used by the US Department of energy to produce eight clean and efficient buses, with a next generation 40 foot fuel cell bus under development by the US department of transportation, and it is being considered to be used in a large fleet. Here is what is so exciting about these fuel cell vehicles. The fuel cell vehicles use less than half the CO2 emissions than normal traditional combustion engine vehicles. They produce half the greenhouse gas pollution and 250 fewer carbon monoxides, practically no nitrogen monoxide and zero particulars. As with all fuel cells, the lack of moving parts will reduce all maintenance. This kind of clean fuel cell driven vehicle is ideally suited for urban transport operations and there are a number of other fuel cell vehicles being built today by various eco car manufactures for example the Toyota Mirai and many more that are undergoing testing. Phosphoric acid fuel cells operate at more than 40% efficiency and nearly 85% with co-generation, this fuel cell operates effectively a ambient pressure and they operate at temperatures around 400°F. The future of full fuel cells in transportation is well worth watching. The proton exchange membrane fuel cell, applications have been demonstrated in buses and trucks. They are the prime candidate for passenger cars. It currently holds the greatest potential for reaching the 80mpg goal set by the government industry partnership and is expected to do this by far exceeding the clean requirements. The fuel cell has a low working temperature at around 200°F and it’s high-power density makes it suitable for urban vehicles where quick start-up is required. As with this phosphoric acid fuel cell the PEN needs hydrogen rich gas and uses reformed fuels but first most the carbon monoxide must be removed. It's most efficient operation occurs at higher pressures. Developments are continuing to help broaden its efficient operation under a variety of conditions. The proton exchange membrane fuel cell differs from others in that it uses a solid proton conducting electrolyte not, unlike household cling film this in mobile as the electrolyte, this simplifies the process, reduces cost and is expected to extend the fuel cell life. Studies have shown that it's qualities give the PEN fuel cell system the option to be comparable at cost in comparison to combustion engines. Both solid oxide and molten carbonate fuel cells operate at a much higher temperatures making the internal processing of hydrogen carbon fuels more simple, further simplifying the system and reducing costs. Because of the improved economics solid oxide fuel cells are showing promise for applications such as industrial electric generators. Already two 25 kW demonstration units are being tested in Japan with a 120 kW operating in Southern California. Solid oxide fuel cells use a ceramic electrolyte allowing temperatures to reach 1800°F, power generating efficiencies up to 45% have been demonstrated. Overall efficiency is much higher in applications that take advantage of the by-product of heat generation. Solid oxide fuel cells are configured in plain stacks on monolithic or tubular structures, a typical tubular cell consists of five basic components. Surrounding support tube a cathode a solid electrolyte and anode and electronically conducting interface airflows from the centre of each tube. Fuel like gas bathes its exterior. In the monolithic solid oxide fuel cell each electrode is comprised of a corrugated layer fused with two flat layers with a solid electrolyte sandwiched between the two electrodes. As fuel flow through the carbon channels, an electrochemical reaction releases electrons starting the flow of current. Although more difficult to fabricate, the monolithic fuel cell configurations is projected to have a higher power density than the tubular or plain solid oxide fuel cells. The molten carbonate fuel cell is currently in the final stages of prototype testing for utility power generation. Like the solid oxide the molten carbonate fuel cell also promises higher efficiencies and low emissions because of high operating temperatures around 1200°F. Because of their high temperatures these fuel cells are also well suited for co-generation applications both systems are ideal for electricity and heat that are needed on a continuous basis. The molten carbonate electrolyte is made up of a mixture of potassium and lithium carbonates which when melted become ionic ally conductive similar to the solid oxide monolithic structure the molten carbonate fuel cell has these corrugated flow channels for fuel and air, but here they're made of stainless steel. while the electrodes themselves are made of forest nickel and nickel oxide again because of high temperatures the molten carbonate and solid oxide fuel cells eliminate the need for high cost platinum catalyst used in lower temperature fuel cells. These fuel cells are inherently simpler and potentially more cost effective. Another advantage is that carbon monoxide considered a catalyst, while poisoning in other fuel cells can be used directly in the cell providing additional fuel and further simplifying the system. How good is this efficient and clean machine, the fuel cell in operation for transportation far surpasses any other energy generating devices in it’s purity of operation. Compared with any current internal combustion engine the emissions with fuel cells using hydrocarbons are minute and when the fuel cell is filled with pure hydrogen the emissions are nearly Zero. Compared to existing turbines and other internal combustion engines, fuel cells electricity generated provides far higher efficiencies. Fuel cells are here today and here to stay, more and more will become part of our everyday lives. We will see the uptake with vehicle manufacturers producing testing and developing more and more hydrogen fuel cell vehicles.